I stopped using soap on my face about a year ago, and, boy, did my skin love me for it. My verrrry dry skin cleared up (with the help of coconut oil) and everything started looking smoother and, well, glow-ier. Instead of soap, I started using honey face wash at night and a homemade daily cleanser in the morning to exfoliate and plump the skin (your face is one area where plumping is a good thing!). 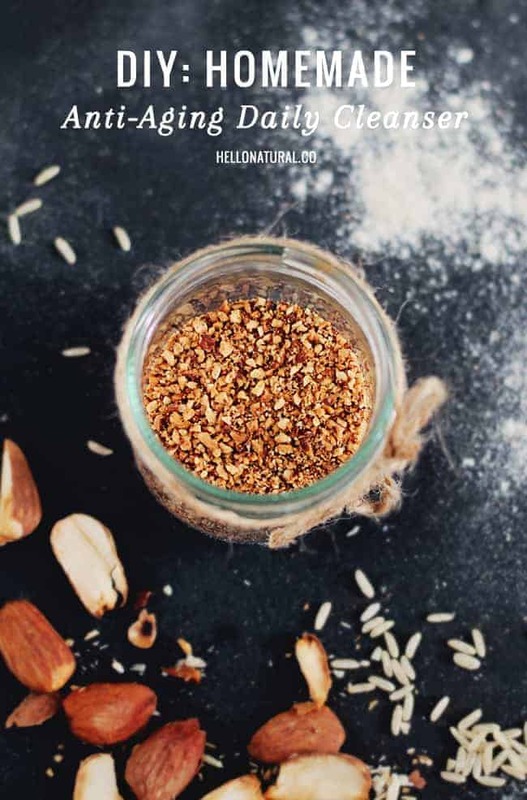 Almond, rice and dry milk powders are all great for mature skin and will leave your skin nourished and hydrated. The fine grains gently exfoliate, and the oil in the almonds provides skin with vitamins A and E. The lactic acid in the milk powder helps with exfoliation while the milk fats moisturize dry skin. Keep dry ingredients in container with a lid beside the sink. This should stay good for about 2 weeks, although you will probably use it up sooner if using daily. If so, plan to remake weekly. To use, combine a pinch of powder in your hand with water or rose water and make a paste. Massage gently into face, neck and chest and rinse. Follow with homemade toner and coconut oil moisturizer. What’s your favorite way to cleanse your skin? Share your anti-aging secrets! Hi, can this recipe keep long if I am to make a big bottle? Would dry buttermilk work as well? I love your recipes for skincare! Thanks so much. One question – how do you remove your makeup? Especially mascara? Hi! I actually find that coconut oil works really well to remove any type of makeup, and often works even better than store-bought makeup remover. Would this work with store-bought, pre-ground almond or rice flour?